Recently range sensors, such as time-of-flight cameras, binary-coded range finders (MS Kinnect), has become broadly available. They provide reliable depth measurement for smooth textureless surfaces with enough reflectance, however their resolution is not outstanding. On the other hand classical stereo setup with HD cameras, provides high resolution depth maps, however has difficulties in textureless or repetitive patterns. Therefore, these sensors are complimentary and a fusion of them should gain higher quality results. A classical work related to this topic is based on low resolution upsampling using a single high resolution intensity image , their code is available and should be used as a reference method. A basic stereo - time-of-flight camera fusion is proposed in . A task of the candidate will be to calibrate the range sensor and the stereo rig together, then use the depth map to initialize the global sub-pixel stereo matching  and evaluate the results with respect to [1,2]. J. Kopf, M.F. Cohen, D. Lischinski, M. Uyttendaele. Joint bilateral upsampling. In SIGGRAPH, 2007. Vineet Gandhi, Jan Cech, Radu Horaud. 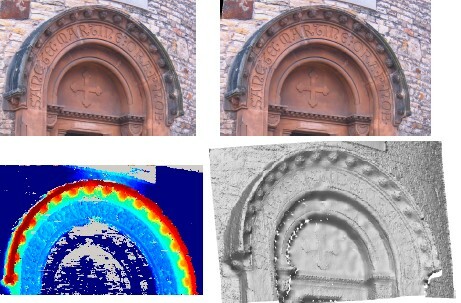 High-Resolution Depth Maps Based on TOF-Stereo Fusion. In Proc. ICRA, 2012. Jan Cech. Accurate and Robust Stereoscopic Matching in Efficient Algorithms. PhD Thesis. Department of Cybernetics, Faculty of Electrical Engeneering, Czech Technical University. June 16, 2009. (Chapter 4.4, pp. 47--50).